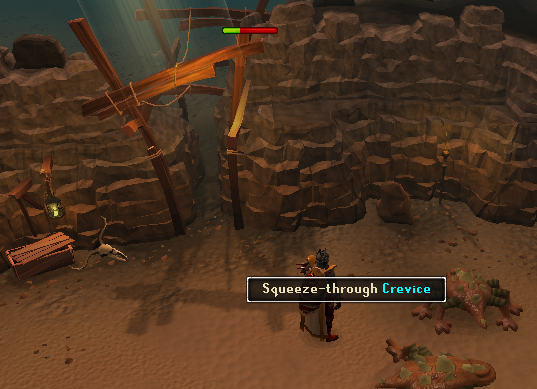 Welcome to the Fremennik Slayer Dungeon, a dark and creepy cavern filled with quite a few deadly Slayer monsters. The dungeon can be found to the east of Rellekka, and to the northeast of Seers' Village. If you're planning on slaying some foul monsters, dust off your Mirror Shield and bring along a bag or two of Salt; there's no telling what might jump out at you! 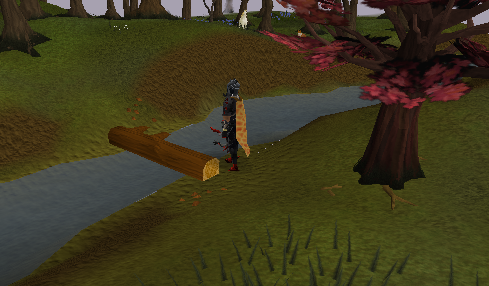 Another possibility is to take the Agility shortcut: A log balance located a bit north of the Sinclair Mansion. For this, you'll need level 48 Agility. Follow the yellow line if you're going to use this route. Also, if you have at least started Fairy Tale Part 2: Cure a Queen, you can use the Fairy Ring combination AJR to teleport right outside of the dungeon. As you can see the dungeon has different rooms: Each of those is populated by one particular type of Slayer Monster. As you go deeper into the dungeon, the monsters get harder and require a higher Slayer level to kill. Once you walk in, you may notice that there is something peculiar about this dungeon: you walk in going east, but once you're inside you'll be traveling west. 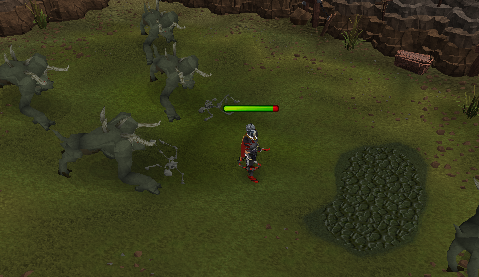 Firstly, watch the Slayer levels needed to kill each monster you encounter. Trying to fight one with too low a Slayer level will cause you to miss and cause no damage. They will attack you and keep doing damage until you run away (or die!). Secondly, remember to wield the correct equipment. If you don't, you run the risk of dying! All slayer monsters that require special equipment can hit very hard and lower all your stats if you don't have it equipped. 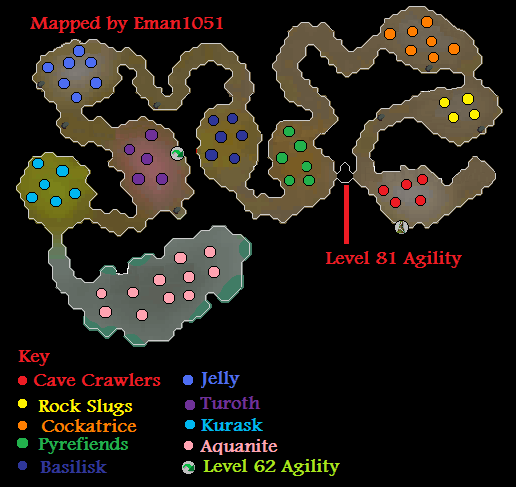 In the first room you will find several level 76 Cave Crawlers, and you will need level 10 Slayer to kill them. 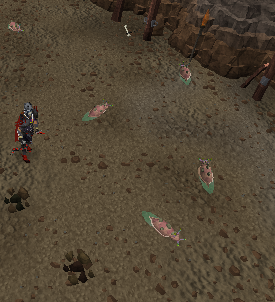 Beware though: They can poison you, so bring anti-poison potions if you need to fight these for slayer. These creatures are also aggressive to low levels. 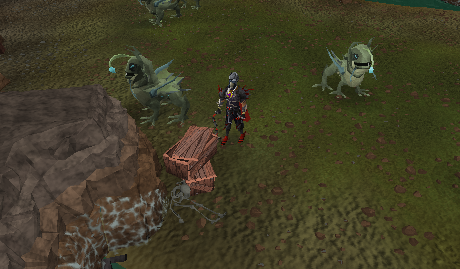 Possible Loot: Herbs, secondary ingredients, Bronze Boots, Half of a Key and the elusive Dragon Shield left half. Walk on and you will find an Agility shortcut: A high level one, 81 needed to cross it into the 4th chamber where Pyrefiends have their home. Next is the chamber filled with Rock Slugs. 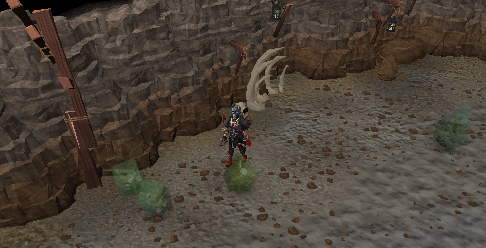 This is the first monster that needs a particular Slayer item to kill: a Bag of Salt you can buy at any Slayer Master. 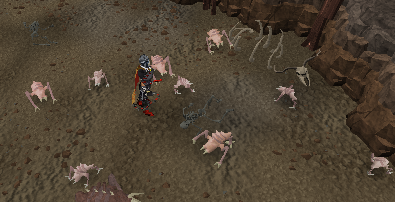 Start fighting it and when it is down to its last Life Point use the bag of salt on it: It is the only way to kill it, cost at a slayer master, 10gp each but rising as you buy. 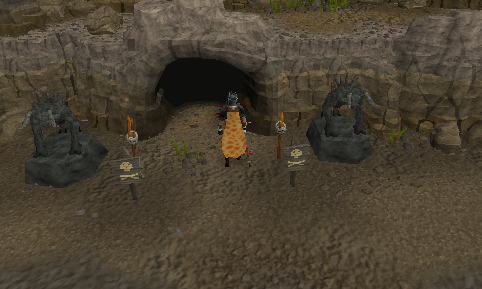 Possible Loot: Mystic gloves, various ores, Dragon Shield Half, Half Key, Runes, Rune Spear. The third chamber next and one filled with bird-like Cockatrice, level 64 with 1,600 Life Points. Again a monster that needs a certain piece of equipment: A mirror shield. The cost at any slayer master is 5,000gp. 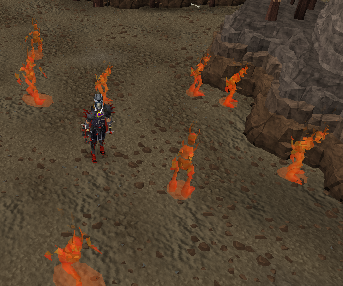 The fourth chamber, also known as a rangers' delight, contains Pyrefiends. They are level 88, have 4,400 Life Points, and require level 30 Slayer. Possible Loot: Steel Boots, Fire Staff, Adamant Medium Helmet, level 2 Clue Scroll, Half Shield, Starved Ancient Effigy, Clue Scroll (Medium). The next room is number 5 and home to the Basilisk. They are level 110, require a Slayer level of 40, and have 2750 Life Points.You need a Mirror Shield to take these monsters on. Possible Loot: Rune and Dragon Spear, Runes, Mystic Hat/boots, Half Key, Left Shield Half and noted Coal, herbs, Basilisk head, Starved Ancient Effigy, Clue Scroll (Medium). This room also has a shortcut on the west side and brings you directly to the Turoths. Agility level needed: 62. Next in line are Jellys in room number 6. They are level 98, require 52 Slayer, and have 2,450 Life Points. When fighting it melee-style the same as with Pyrefiends: use Dragonhide armour. Possible Loot: Left Half Shield, Rune Full Helm, Half Key, Thread, Mithril Boots, Rune Battleaxe, Rune Full Helm, Starved Ancient Effigy, Clue Scroll (Hard). Chamber 7 houses Turoths. They come in 4 different levels: 86, 123, 126, 130. All require a Slayer level of 55. Life Points are: 4300, 4000, 4200, 4400 respectively. Fighting with melee, you'll need a Leaf-Bladed Spear (31,000gp), some Broad Arrows (50gp+ each) for the ranger and the mage will need to use the Slayer Staff's (21,000gp) Magic Dart spell. The eighth chamber houses one of the two aggressive monsters: level 112 Kurasks. 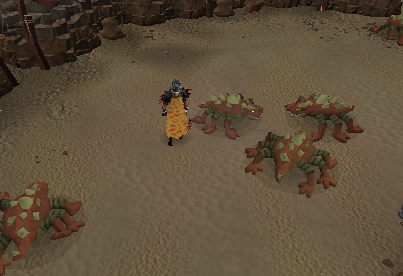 You'll need 70 Slayer to kill them, and they have 2,800 Life Points. As with Turoths, use Leaf-Bladed Spears for melee, Slayer Staff needed to cast Magic Dart for mages, and Broad Arrows for the ranger. 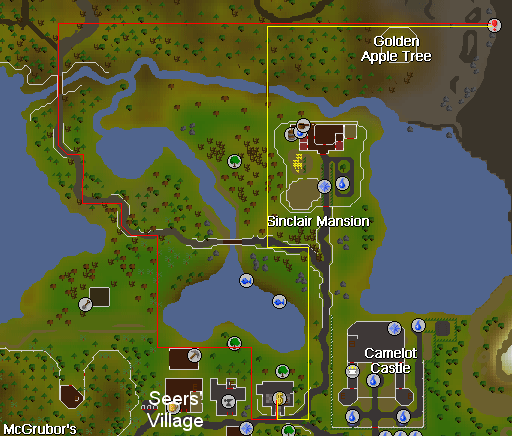 There are 3 good range and mage spots. Be careful though: they can hit pretty hard - up to 224 Life Points - and there is the problem of not much melee Defence for mages and rangers and their armor. 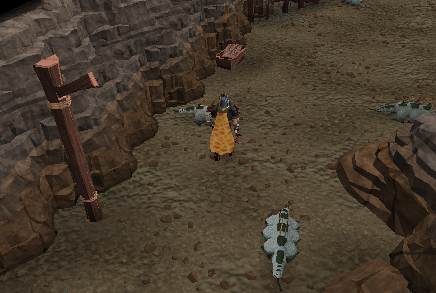 Possible Loot: Mystic Top, noted Flax (25), Rune Long, Adamant Platemail, Clue Scroll (hard), White Berry, Half Shield and Half Key, Kurask head, Starved Ancient Effigy. In this last chamber you will encounter the Aquanite. They are level 136 and have 3,400 Life Points. To kill them you must have at least level 78 Slayer. They attack using magic attacks. 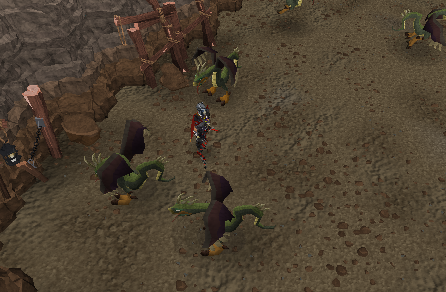 It is best to wear Dragonhide Armour. They will hit through your protection prayers for up to 250 damage. Possible Loot: Amulet of Ranging, Clue Scroll (Hard), Dragon Spear, Rune bolts, and Rune Darts, Water/Air battlestaves, herbs, Starved Ancient Effigy, Long/curved bone, Snape Grass. All Mystic items dropped in the Dungeon are white or yellow, while black and red Mystic items are dropped in the Slayer tower near Canifis.